Join the Rosenberg Fund for Children for a birthday party and jam session celebrating folk legend Pete Seeger on May 3rd, the 100th anniversary of his birth! Come enjoy an evening of music and memories, celebrating the 100th anniversary of the birth of RFC Advisory Board founding member Pete Seeger. Pete Seeger was a staunch supporter of Julius & Ethel Rosenberg and (along with his wife Toshi) an original Advisory Board member of the Rosenberg Fund for Children. Drop in any time from 7-10 pm to this party and informal jam session at the RFC office in the Eastworks building in Easthampton, MA. Enjoy refreshments, music, Seeger memorabilia, and rare recordings including Pete giving the only known performance of a Woody Guthrie song about the Rosenbergs. Attendees can register to win a pair of weekend passes to The Great Hudson River Revival (aka The Clearwater Festival), in June. Month-long exhibit on Pete Seeger’s life, mostly images of him in various media, including paintings and photographs, and a grouping of paintings depicting scenes from Ecclesiastes, aka Turn, Turn, Turn. This year’s celebration of Pete Seeger will be an historic one. It’s Pete’s 100th birthday! So in addition to having a rollicking good time, featuring many of Pete’s favorite songs, sing-alongs and compositions, you might also discover something you did not know about Pete’s amazing and inspirational life. We will attempt in a two-hour program to cover many, if not most, of the different phases of his career, from his upbringing in a highly musical family and early influences through more than 75 years as a performer. 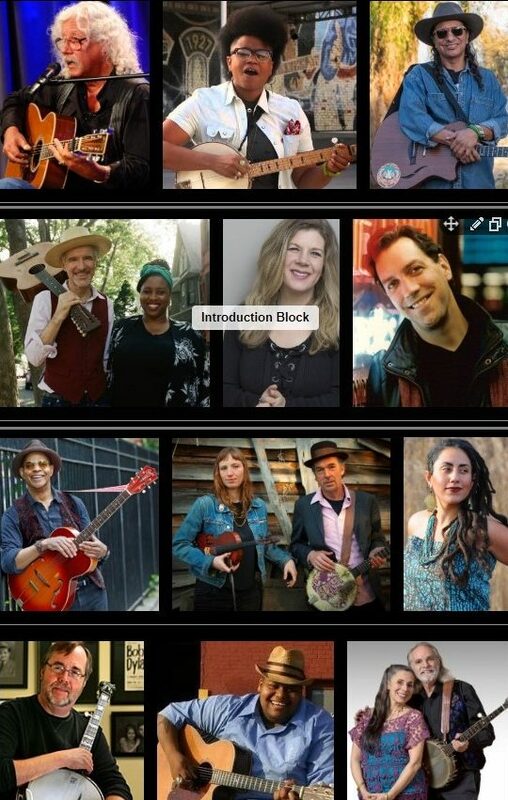 Artists include Piedmont Blüz, Bev Grant, Hudson Valley Sally, Lindsey Wilson, Mike Glick, Vincent Cross, and others – maybe even a surprise guest or two! This concert will be a benefit for the Peoples’ Voice Cafe. Featuring the Vanaver Caravan & special guests Happy Traum, Tom Chapin, Maria Muldaur and the Southern Dutchess Coalition Choir. Includes more than 20 of Pete’s beloved songs, from children’s tunes to activist anthems, including We Shall Overcome, Big Muddy, Wimoweh, Where Have All the Flowers Gone, and of course, Turn Turn Turn. The show features a variety of dance styles, from clogging to swing and Zulu gumboot dancing, and uses historical photos and recordings to take viewers on a journey through American history. Audiences leave the theater humming Pete’s timeless songs, moved by his enduring message, and inspired to make our world a better place. Likely the best known folk singer of all time, Pete Seeger’s career as a musician was highlighted by great popular success with the group The Weavers and songs such as “Where Have All the Flowers Gone,” “Turn, Turn, Turn” and “If I Had a Hammer”; Grammy Awards including a Lifetime Achievement Award, a National Medal of Arts, induction into the Rock ‘n Roll Hall of Fame; and author of one of the most influential instrumental instruction books ever published “How to Play the 5-String Banjo.” He used his music to further social, humanitarian and environmental causes – most notably in the founding of the Clearwater in an effort to save the Hudson River, and one of his closest musical associates Arlo Guthrie will be joined by a baker’s dozen of artists including Amythyst Kiah, Cary Morin, Dan Zanes & Claudia Eliaza, Dar Williams, David Gonzalez, Guy Davis, Richie Stearns & Rosie Newton, Taina Asili, Tony Trischka, Toshi Reagon and Bill & Livia Vanaver – that are keeping his message alive for an evening of music, dance and poetry inspired by Pete Seeger in celebration of his centennial. Net proceeds from the concert will benefit Clearwater, Caffe Lena and WAMC Public Radio.